Sometimes, I just don't have a year to wait for weathered pots, so I take a little pot from a yard sale to be my next topiary victim. I started to take the tag off, but then thought you might want to see how much it was. It just makes me like it even more. 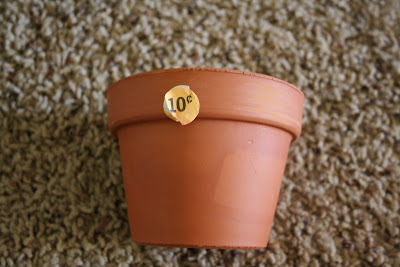 Get a little antique white craft paint, put it on a plate, add a few drops of water to thin it out, wipe it on with a paper towel here and there, wipe it off with another, and we have our weathered pot! Now, it's just begging to hold a topiary. I have a different version to show you with leftovers from the last one! A few of you have asked questions, so I thought it would be a great day to answer some. Q: Do you get glossy or matte Wal-mart cream spray paint? My store doesn't have a choice~I just grab what they have. It's not flat, but it's not high gloss. Probably just a satin. And it's called almond, but I just call it cream because almond makes me think of an almond joy I really want right now. Q: Are you going to give us a tutorial on the dresser you did in your boys' room? *primed it, painted it with two coats of the green. When you paint dressers, doors, anything that you don't want brush streaks on, use the small foam rollers. *spray painted the top with a Rustoleum spray paint called flat brown~it was most like the hue in the tin stars, so I chose that one. That's it! 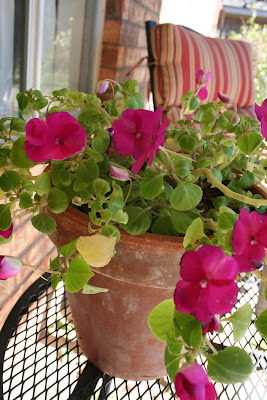 It was on our back porch for the whole week while I did little tidbits here and there and waited for coats to dry. My boys' clothes were everywhere, it was so good to get it back in the room! Happy Monday, and oh~I can't wait to show you what my sister did with her round tabletop!! It turned out fabulous. Later gators! Love the look of the weathered pots. Thanks for sharing how to do it! Can't wait to see what your sister did with the round table!! Thanks for all the great info! Can't wait to see your sisters stuff. I love your weathered pots! 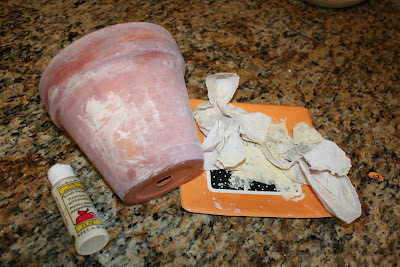 I love to use tarracotta pots too for projects! I'm loving the weathered look! Great transformation!